Fill in the gaps in your kitchen collection with our kitchen bowels, colanders, and strainers. It doesn�t matter if you are a gourmet chef or just beginning to learn cooking it is essential to have the right tools in your kitchen. Keep your kitchen stocked with all your favorite kitchen bowls, colanders, and strainers. When you are cooking you need to hone every ingredient. Colanders and strainers allow for easy draining before seasoning your meal. Giving into your sweet tooth? To whip up batter, you�ll need a good collection of mixing bowls. 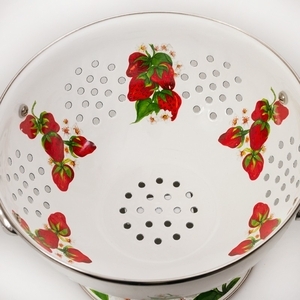 We especially love our strawberry colander with its classic simplicity this colander becomes the cornerstone of any kitchen, boasting heavyduty enamel this is also dishwasher safe.